Open 8-5 Mon-Fri, 10-4 Sat, closed Sun. Most always blowing glass Mon-Fri 8-3 sometimes later. Come watch glass being made out of the molten material, and tour the gallery filled with glass wonders. Maybe even try your hand at making your own orb with our ''make your own'' program. The Glass Forge is 40 miles north of Ashland, or 50 miles south of Roseburg. 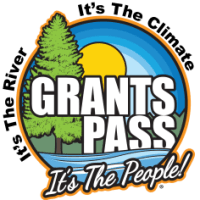 Take the Grants Pass Exit 58, head down 6th Street, right on “G” Street. We are at the corner of “G” and 3rd Street.